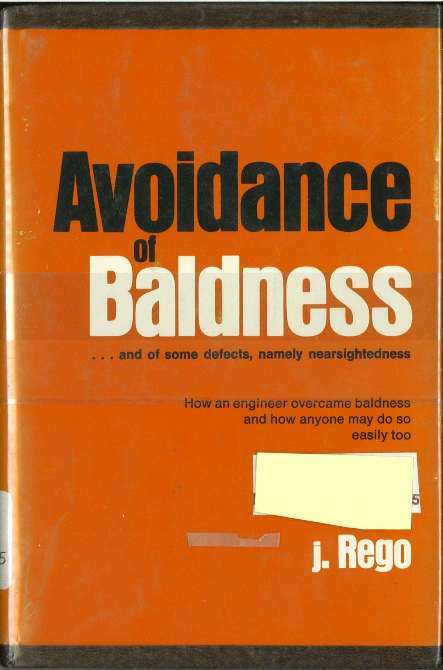 Submitter: Found on the shelf of a big, urban, central public library while weeding the 600s. I don’t really know what to say about this one. It speaks for itself. My grandmother wore a wig for most of her adult life. 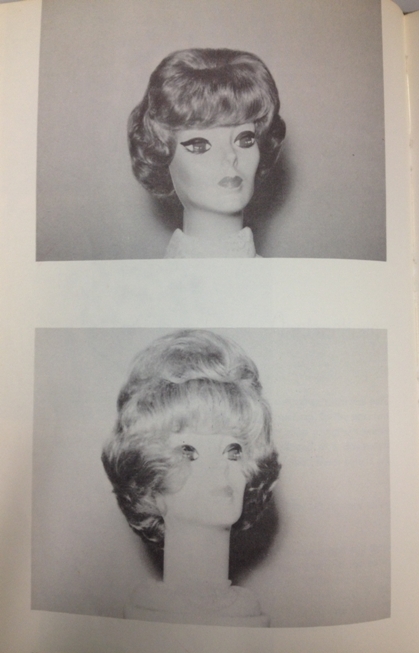 She had hair – she just didn’t like her hair. I remember going to her house and seeing those disembodied heads with wigs on them and being both fascinated and horrified by them. 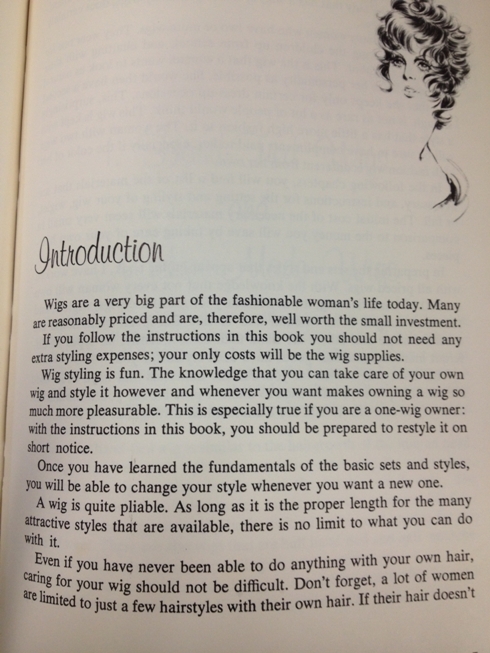 The other thing that this book reminds me of is the time I took a curling iron to my Barbie doll. That did not end well. 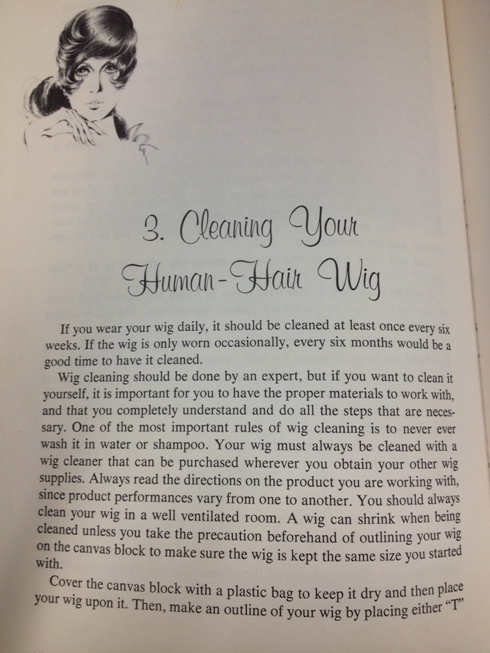 All this reminds me of is the fact that a Swedish-English phrasebook bizarrely had a sentence for “Clean and set this wig”. Not quite as bad as the notorious postillion sentence, but still unusual. The last style is awe inspiring! It looks more like a work of masonry rather than coiffure. The information as well as the styles is outdated in this book. I started losing my hair when I was 13 and wear a human hair wig, and can’t imagine only washing it every 6 weeks! I wash it in the shower with good quality shampoo and conditioner at least once a week, and I have no idea why it would “shrink.” They must have made them out of something different then. 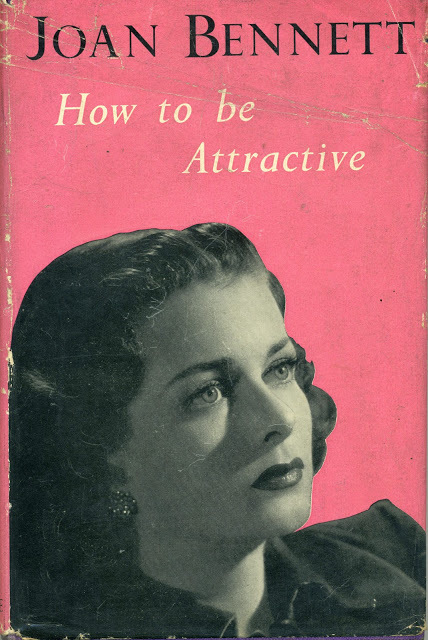 At any rate, nothing at all in that page is accurage so, basically, this book is useless in every way except for that of amusement. Before she met my dad, mom used to support herself and my 3 brothers after her first husband took off by styling wigs for various stores and salons. She’d probably recognize many of these styles and techniques. 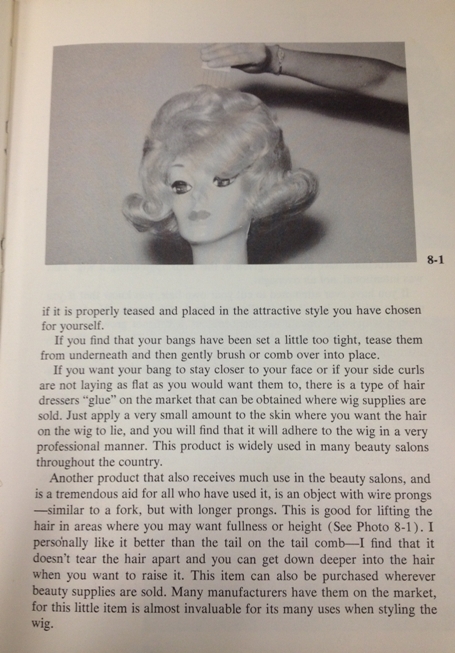 I love old beauty books, but I hate wigs. I gave mine a haircut. That definately did not end well. Hey, some of the styles have come back. The woman in the cover photo is wearing Snooki’s Bump-It. 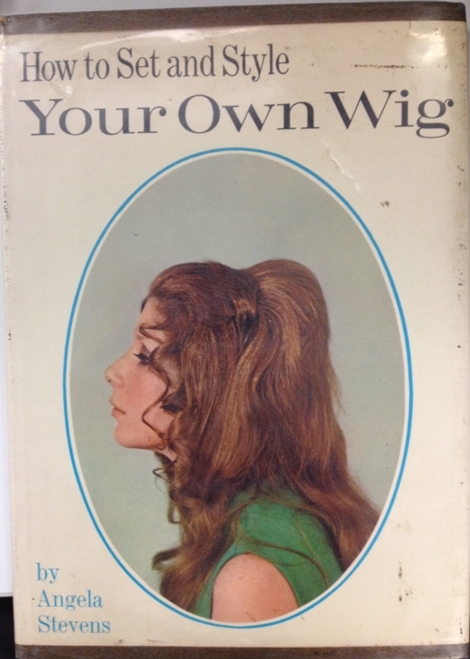 My grandmother wore wigs in this era (not because she was losing her hair–she’s still got it–but because she didn’t like it much, and wigs were fashionable), and some of them that kicked around definitely had dried out, shrunken elastic parts. 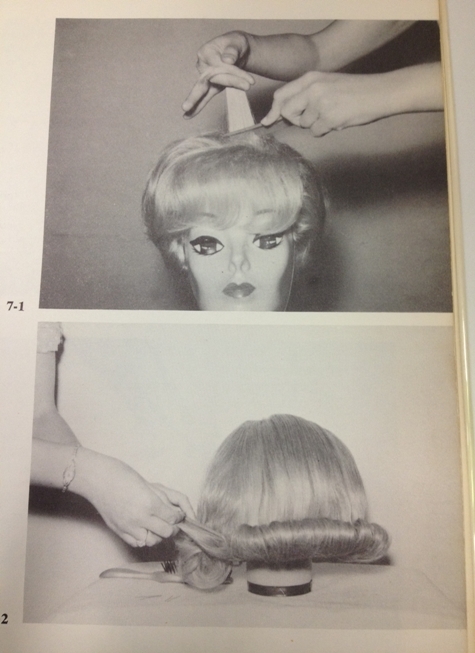 This might be a fun book in a hairstyling school’s library, for history of the craft (and maybe fun mastering the era’s hairstyles), but for a current public library collection, probably in with bits on how to style yourself for job interviews? Thumbs down, unless you have, for some reason, a style history research section. 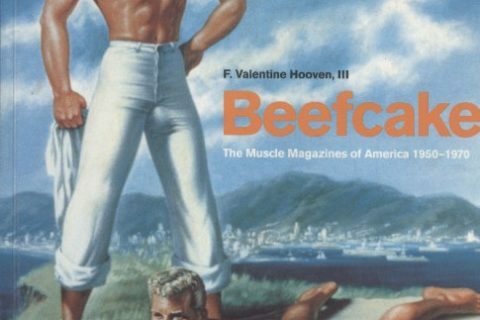 Is it just me, or is the cover model Lady Gaga? 3rd picture up – Thunderbirds are go…….